Martellus Bennett during OTA workouts. New Green Bay Packers tight end Martellus Bennett said he may not be a captain, but he is the captain of fun. Quarterback Aaron Rodgers said Bennett brings a lot of confidence to a team and feels he could be in the captain role before it’s all said and done. 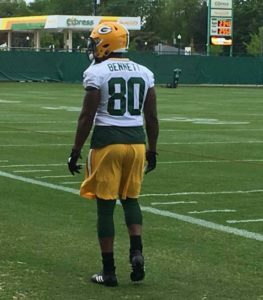 Bennett’s skill level on the field will suit the Packers well. But his ability to blend with his teammates has stood out. Bennett said having chemistry with every player on the team and getting to know all of his teammates is important to him. Bennett has done the same with the Dallas Cowboys, New York Giants, Chicago Bears and most recently the New England Patriots. New England is where he experienced pro football’s pinnacle, winning a super bowl. It took Bennett awhile to reach a Super Bowl. Now in his 10th NFL season, Bennett says he knows what it takes to get there and he wants more. Getting to know his new teammates is a work in progress. Bennett will continue to inject his personality into the daily lives of his new friends. He’s hoping the end result is a chemistry that will help the Packers win pro football’s top prize.